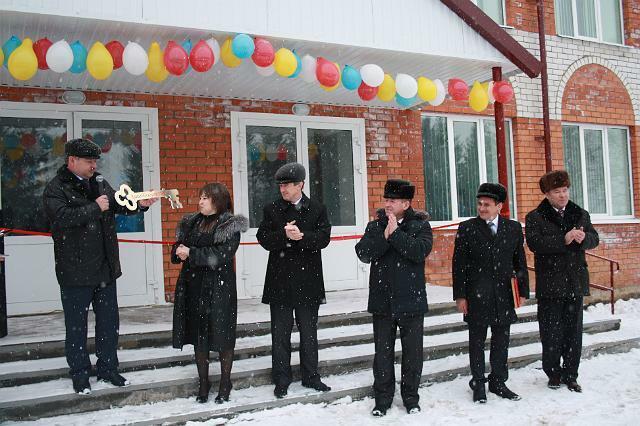 February 29 opening ceremony outhouse Krasnochetaysky secondary school for 240 pupils. Construction outhouse began April 27, 2011. This need was due to congestion of the school. In Krasnochetaysky secondary school has 569 students, and the available space is not sufficient to enable children to engage in one shift. In this regard, the district administration and the government of the republic, it was decided to expand the area of the school. And in accordance with the agreement between the Ministry of Agriculture of the Chuvash Republic and the administration Krasnochetajsky region within the framework of the federal target program "Social development of village until 2012" in the construction of outhouse Krasnochetaysky secondary school. On the day of entering a new school outhouse with a welcoming speech to the teachers, parents, builders were district directors of educational institutions, parents, veterans of pedagogical work, the head Atnarskogo rural settlement, the head of OOO "Zhilservis" and many others. All are warmly greeted with a wonderful event — the opening of the outhouse. A call to attach this light building does not want to. In fact, this new school, it is impressive — spacious and comfortable. This day does not just welcome, but he opens up to a rural area a whole new perspective. Indeed, in this building, you can learn only from "4" and "5". There is no doubt that here the students and teachers will be comfortable to learn and work. Pristrom Krasnochetaysky school is ready for operation, and here boils real, eventful school life.